How was your weekend? We had great weather on Saturday and we went out of town for a day. Yesterday, it was raining on and off the entire day and we stayed home most of the time, doing some fall cleaning and also some decorations. Of course, here in Florida it doesn't feel that much like fall until you go shopping for sweaters and long pants. It happens that I never did care much for the typical colors or styles of fall fashions. Thankfully there is a particular brand of clothing that sells fall clothing in cheerful colors especially pinks, my favorite color of all. We in the northern hemisphere are just past the Autumnal Equinox, so I made a couple of leaf themed bento for Nikolai last week. 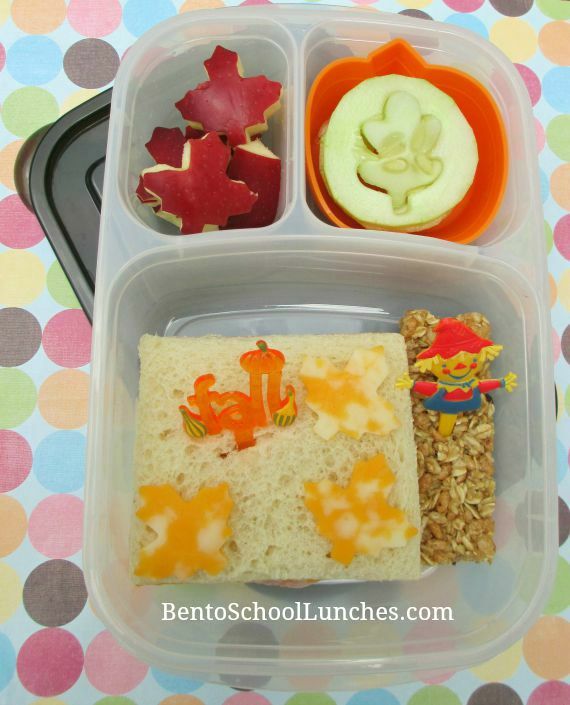 You can also find some fall themed lunches which I made in the past here. 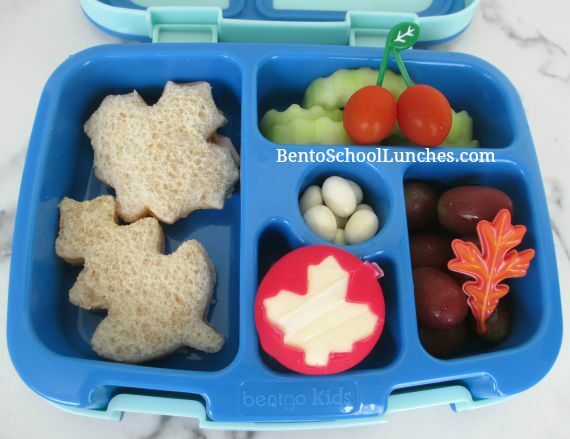 Here in the first bento I have a couple of leaf shaped sandwiches which I shaped with cutters. I used a smaller cutter to remove some of the wax covering a mini Babybel cheese. My favorite crinkle cut knife was used for the cucumber slices over which I put a couple of cherry tomatoes and a pick. A fall leaf pick was added to decorate some red grapes and in the middle I included some yogurt covered raisins. I packed this lunch into a leak proof Bentgo lunch box. For this second bento I used a couple of small leaf cutters. One was used to shape slices of Colby Jack cheese, and also to cut shapes from slices of apple. The other was used to cut the center sections of a few slices of cucumber which I put into a pumpkin shaped silicone cup. I also used a couple of picks, one of them decorated the sandwich and the cute little scarecrow one is protecting the granola bar. I packed this bento into an Easylunchboxes urban. Simple and fun lunches!! Fall is my favorite season too! These are lovely, such fun lunches! Wish we had four seasons here too, all we have in the tropics is hot humid weather all year round!